The purpose of this event featuring Tom Bower, David Aaronovitch and a panel of so-called expert witnesses is unclear. Is it intended to reveal the war crimes committed by Tony Blair? Will it focus on the lies and fabrications surrounding the illegal and criminal invasion of Iraq? 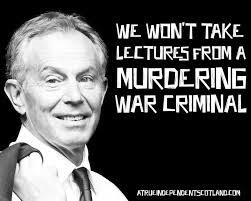 The evidence is overwhelming: Tony Blair is Britain’s most « outstanding » war criminal. I doubt that this event will focus on Tony Blair’s record of crimes against humanity. In the spirit of a British style « Debate », the pros and cons will be put forward, the positive and negative political contributions of Tony Blair will be presented. Tom Bower is outnumbered. The panel of so-called « expert witnesses » is in large part composed of cronies and apologists of Tony Blair. For them war crimes are « collateral damage ». A « good » and outstanding Prime minister, occasionally involved in fraudulent behaviour, « made mistakes ». The issue, however, is not only Tony Blair. It’s all the people within Britain’s establishment who over the years actively collaborated in planning and implementing war in the Middle East. With regard to Iraq, these « mistakes » resulted in millions of deaths and the destruction of an entire country. That is the unspoken truth, which will not be mentioned by the British media. Blair will not be on trial for his war crimes under Nuremberg, he is « on trial » for his « political errors ». This is not a balanced debate between Tom Bower and David Aaronovitch. Tom Bower is outnumbered. The panel of so-called « expert witnesses » is in large part composed of cronies and apologists of Tony Blair. For them war crimes are « collateral damage ». The main issues will be avoided. Where are the witnesses of war crimes, –e.g. the children of Iraq, those who were tortured, the surviving families of more than a million Iraqis killed. Where are the human rights lawyers? The anti-war activists. While the Tony Blair on Trial Debate was hardly publicized, the organizers have announced that the event is sold out. You can however join a waiting list by giving your name and email. « As they slug it out, Bower and Aaronovitch will call upon their specially chosen expert witnesses to bolster their case. Is the event being used to whitewash the criminal record of former Prime minister Tony Blair? When Tony Blair became prime minister in May 1997, he had a landslide majority, an approval rating of 93 per cent, and he went on to become Labour’s longest-serving premier. At his last PMQs he got a standing ovation in the chamber of the House of Commons. How things have changed. Nowadays all we hear about is the accusations of lies, hubris and money-making business deals. But is this disillusionment justified? To assess the record of this extraordinary politician, Intelligence Squared are staging Tony Blair on Trial. Levelling the charges against him will be Tom Bower, the investigative journalist who is about to publish his most explosive book yet: Broken Vows: Tony Blair and the Tragedy of Power. Bower will admit that he shared the hope and excitement that millions felt when Blair took office promising a New Labour programme of modernisation and reform. But that general optimism was swept away by the controversy over the Afghanistan and Iraq invasions, and the ‘dodgy’ dossiers about Saddam Hussein’s weapons of mass destruction. The spin didn’t stop there, Bower will argue. Blair’s claims to have improved Britain’s schools, hospitals and welfare services will all come under his forensic spotlight. As for Blair’s record since leaving office, how is it, he will ask, that the man who risked his government to destroy Slobodan Milosevic and Saddam Hussein has earned a fortune advising leaders of highly dubious regimes? All this is a travesty, according to David Aaronovitch, award-winning columnist on the Times, who will be defending Tony Blair in our event. The problem, as Aaronovitch sees it, is that the political classes hate Blair. The Left have never forgiven him for proving them wrong and the Right have never forgiven him for defeating them. But in the country at large, Blair’s legacy is overwhelmingly impressive. Take education. Teaching standards were raised, and flagship programmes such as the academies and Teach First, which fast-tracks bright graduates into London’s toughest schools, were instigated and later embraced by the Coalition. Childcare was provided for millions of working parents for the first time. The same thing happened on health. Without Blair’s NHS reforms it is hard to know how the system would have coped. The minimum wage, equal rights for gay people, a Welsh Assembly, a Scottish Parliament, a London mayor – many of these initiatives were controversial when first proposed but are now part of the political consensus. As for military intervention, Aaronovitch will point to the success stories of Kosovo and Sierra Leone, and argue that the current crisis in the Middle East is more the result of the West’s refusal to act than any failure of Blair’s. As Labour’s warring tribes – the Blairites and Corbynites – threaten to tear the party apart, there could be no better time to examine the legacy of the man who reinvented Labour and triumphed in three general elections, but who is now one of this country’s most controversial figures. As they slug it out, Bower and Aaronovitch will call upon their specially chosen expert witnesses to bolster their case. Join us on March 7th, hear the arguments and cast your vote. Image: Work is a derivative of “Tony Blair, UK Prime Minister (1997-2007)” by Chatham House, licensed under CC BY 2.0. Columnist on the Times, author and broadcaster. His books include Voodoo Histories: the role of Conspiracy Theory in Modern History and most recently his memoir Party Animals: My Family and Other Communists. One of Britain’s leading investigative journalists known for his unflinching biographies of Robert Maxwell, Mohamed Fayed, Gordon Brown, Richard Branson and Conrad Black. His latest book, just published, is Broken Vows: Tony Blair and the Tragedy of Power. Emeritus Professor of Mathematics Education at King’s College London. Director General of the Royal United Services Institute from 2007-2015. He has been a specialist adviser to the House of Commons Defence Committee since 1997.